Go to Administer » Site building » Modules and click on To Do Block to install the Block extension for the To Do module. 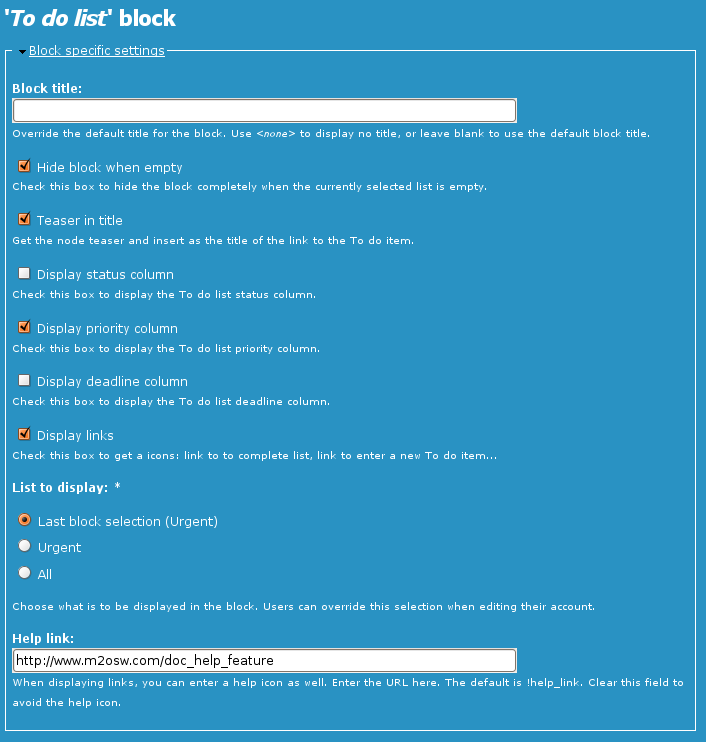 The To Do Block has settings defined in the Block configuration form. The image on the right is a sample of the available options. Click on the image to see a full scale version (1:1). To find those settings, go to Administer » Site building » Blocks (admin/build/block) and search for the To Do Block. Don't forget to add the block from the Disabled region to one of your visible regions. Here you recognize the usual Block title at the top. By default, the module dynamically generates a title that depends on the current situation. By entering your own title here, you will forfeit that feature. By default, the block always stays visible. This option lets you hide the block when no more To Do items are assigned to the current user. If you use the To Do Block to display To Do Items with a sporadic frequency, then this is generally a good idea. If you are managing many items, it probably will never disappear anyway. If you are in between, know that by hiding the block you also lose access to the several icons offered by the block. The fact that the list in your block is empty does not mean that your list of To Do Items is empty. The block does not always display all the items. The Tab feature of the block let you switch between Urgent and All. If you still have a few items in the All list, but know in the Urgent list, clicking on Urgent will "inadvertently" hide the block on your next page load. There is currently no way to restore your block and set it back to All until you add a new Urgent item in it. The block lists the To Do Items as links to the corresponding To Do item page. That link includes a title attribute that can be set to the teaser of the To Do item. At this time, this feature removes all the HTML and the result can be poor. Therefore it is not recommended. I will look into adding the Overlib library to display a really nice full HTML drop-down. The block displays a list of the To Do Items that one should be working on. None of those columns are required. You cannot remove the To Do item title column. Go to a To Do form so the user can add a new item. Go to your list of To Do items. The links will also disappear when the block gets hidden because of an empty list. It is posible to let the user choose whether he will see the Urgent or All the To Do Items assigned to him or force one or the other. To let the user choose use Last block selection. This feature uses a PHP session variable so each user can have a different current setup. When the Last block selection option is selected, the user sees a couple tabs at the top of his block. The tabs are Urgent and All. If you use the Hide block when empty feature (first checkbox) then clicking on Urgent when you do not have any Urgent To Do Item will have the side effect of hiding the block the next time you click on a link. Once the block is hidden, you cannot choose All since the tabs are gone. There are several ways to fix this issue: (1) change the configuration to All forcing all users to see all their pending items; (2) add an Urgent item for that user; (3) reset all sessions1. You are more than welcome to change this link to point to your own website help pages. The To Do Block sub-module requires the To Do List module and the Block module. Note that the Block module is mandatory in Drupal Core so you do not have to worry about that one. For additional information, see the To Do List Known Issues page. 1. This is not accessible from the Drupal interface. Resetting sessions is something that your PHP guru can do for you.